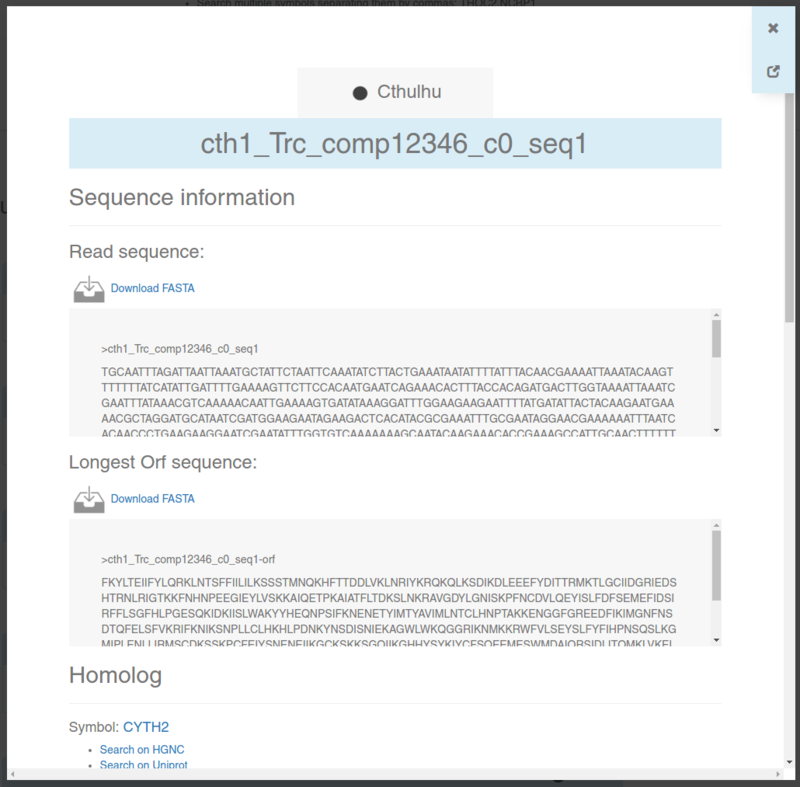 GeneSearch allows users to look for proteins/contigs across the different planarian transcriptomes and Human reference interactome. Human protein symbols. This will retrieve all the homologous contigs to the specified human protein. E.g. THOC2. You can use the wildcard *. E.g. THOC* will display the nodes homologous to THOC, THOC1, THOC2, THOC3, THOC4, THOCXX, etc. Gene Ontology identifiers. This will display all the planarian contigs with a human homolog with the specified GO code. E.g. GO:0000002. PFAM identifiers. This will retrieve all the planarian contigs with the specified PFAM annotated through our protocol (that is, with HMMER with a e-value cutoff of 10-10). E.g. PF01369.15. You can do multiple searches at once, using commas ',' to separate each item. 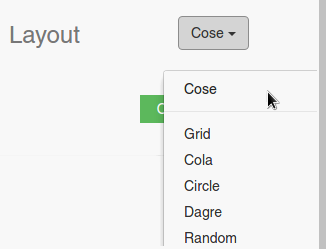 You can mix the different types of symbols in the same search, e.g. PF01369.15,GO:0000002. If there are proteins/contigs in the selected dataset that satisfy the search criteria, you will get a list of symbols inside blue boxes (see image). The symbol on the top right of each box always represents the database to which the symbol belongs. If the selected dataset was a Planarian transcriptome, the Human homolog will be specified inside the box, as can be seen in the image. Click on any of the boxes to get an information card, which will contain a summary of the information stored for that particular protein or contig. An information card is a brief summary of a contig or protein stored in any of our interactomes. 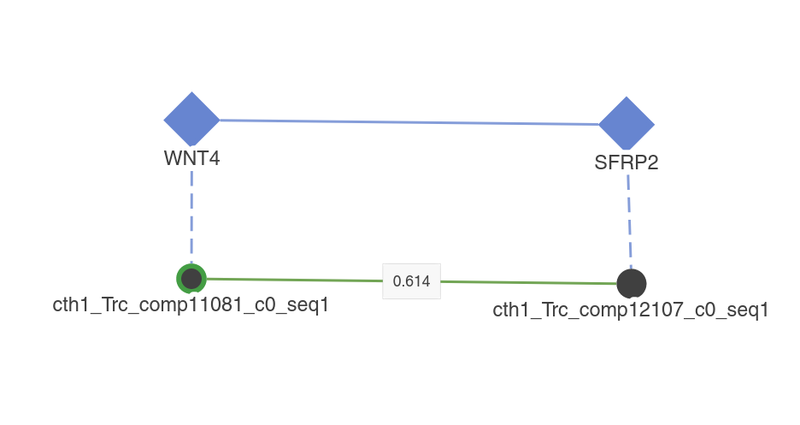 Here, you will be able to download FASTA sequences, look for the annotated homolog for each contig, look for annotated PFAM domains, GO codes, and predicted interactions. You can navigate through different contigs/proteins without losing the results from GeneSearch, NetExplorer or PathwayFinder: only the information card will change. You can also navigate back using your browser's back button ←. Close the card using your Esc key or the x button on the top right. If you want to see the card in full-screen mode in a new tab (for example, to print it), click on . 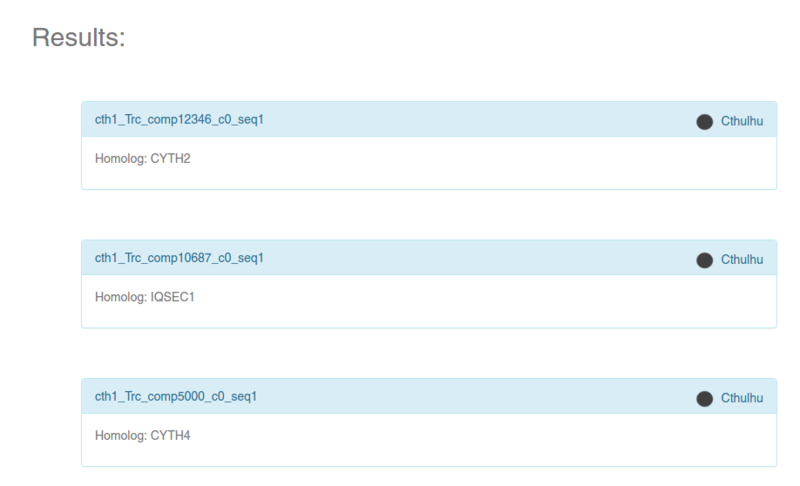 Once you have typed the symbols you want to look for, and have selected the appropiate dataset, click on the button + Add. Note that you will not lose the network already displayed on the left, so you can add nodes individually without losing the visualization. All the nodes for which you have searched (either using this search function or by "expanding" them, see below) will be outlined in green, so that you can remember them. When changing this switch to On, the homologs of the displayed planarian contigs will be drawn on the visualization. They will appear as blue diamonds. 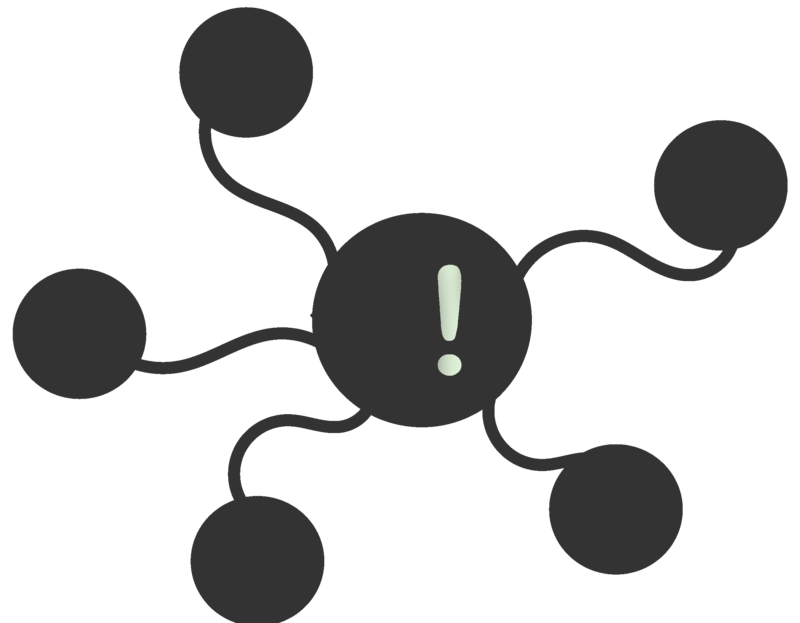 They behave as all the other nodes, but with the exception that you can't Expand them. Turning this option On or Off will not change the layout of the planarian nodes. This button will add all the interactions between the nodes displayed on the visualization. It will NOT add any node. Activating this button will remove all the nodes without a visible connection. Note that this applies to all types of connection (homology or interactions). 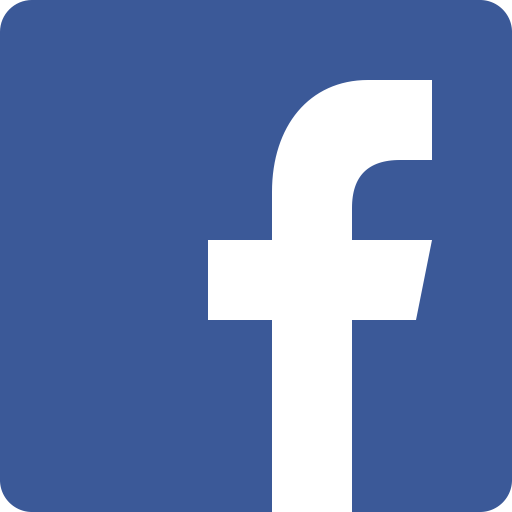 Use together with Filter interactions to filter networks. With this slider you can hide the interactions using the percentage of votes of the random forest classifier as a cut-off. Note that the hidden interactions are not removed, so you can get them back by using another cut-off. Right now, the only available cut-offs are: 0.6, 0.65, 0.70, 0.75, 0.8, 0.85, 0.9 and 0.95. You can use this function in conjuction with the Remove Unconnected button to filter the graphs; first filtering the interactions by the desired cut-off, and then removing all the unconnected nodes. This is useful when wanting to work with a more accurate network, or when the nodes displayed on the visualization is too high. When this behaviour is set, an information card for the clicked contig/protein will appear on the screen. These cards are the same displayed in the Gene Search application. When clicking on nodes you will add all the interactions for such node to the visualization. Delete the clicked node and all its interactions. 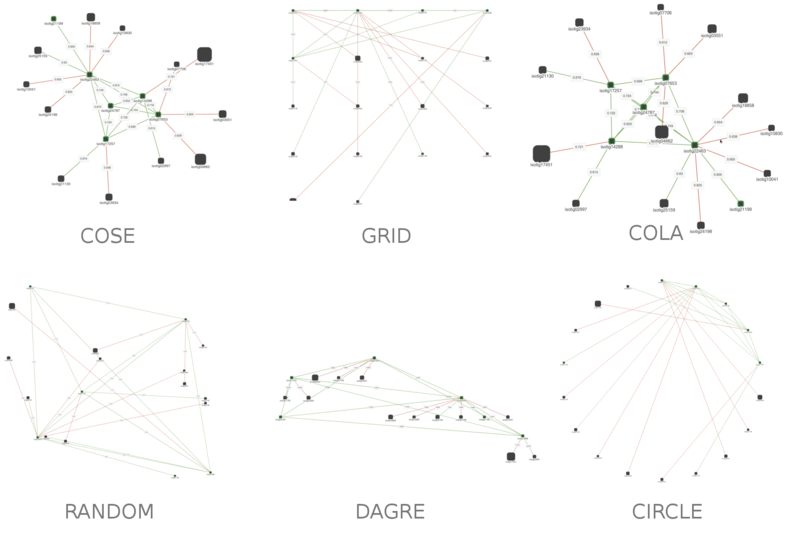 Note that all the other nodes displayed on the graph will NOT be removed, even if they have no other interactions. If you click on the Map Expression button, the dialog showed on the above image will appear. Using this dialgo, you will be able to select a Expression experiment and map the expression values over the displayed nodes on the visualization. There are two ways in which you can do this: mapping the values of one sample as a color gradient, or mapping the logFC of two samples as a divergent color gradient. 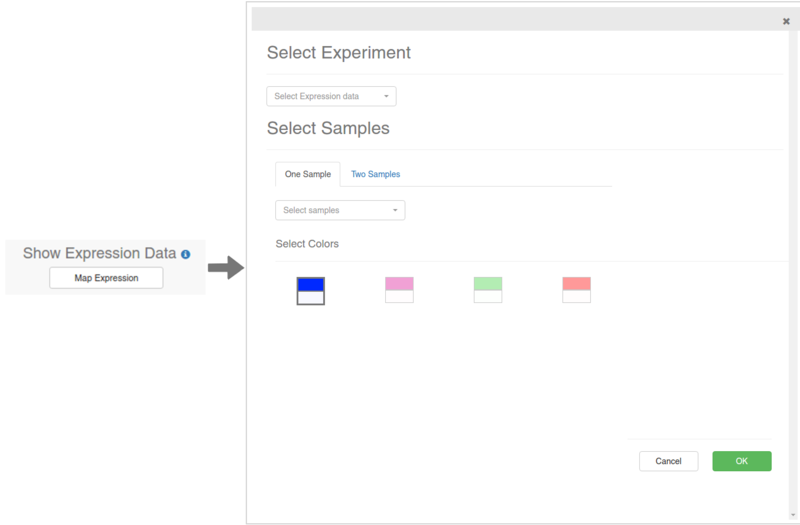 Make sure you are selecting two different samples in the Two Samples mode. 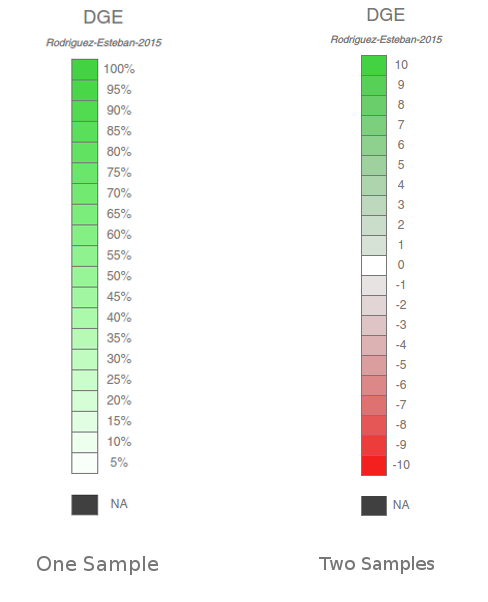 If you are in One Sample mode, each color will represent the percentil to which the expression value belongs; for example, the color for the percentil 10% indicates that the nodes colored like that have a expression value lower than 95% to 90% of the genes in the gene expression experiment. If you are in Two Samples mode, each color will represent the log2FoldChange between the selected sample 1 and sample 2. In either case, the nodes colored as NA are contigs for which there is no expression information for that particular experiment and sample. When a expression experiment has been mapped onto the visualization you can keep adding nodes normally. However, if you want the expression to be mapped to the new added nodes, you have to open the dialog again and re-run the process. Don't expect new nodes to be colored according to the expression information previously mapped. 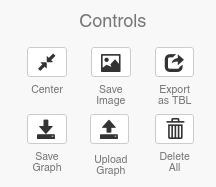 These simple buttons allow users to save, import and export the visualization in several formats, as well as centering it to the screen. Center the visualization when clicked. Saves a png image of the visualization. Please, take note that the expression legend will NOT be saved, as it is not part of the visualization. Exports the graph (nodes and edges) as a tabular file. This graph can then be imported to Cytoscape, or Gephi, or other programs to perform further analyses. Saves the graph as a JSON file. This is the format used by NetExplorer. If you want to save a particular visualization to work on it later in NetExplorer, use this button. All the positions, colors, nodes and edges will be saved and they can be restored. Imports a JSON file (exported by using the previous button). All the visualization will be restored. Any network on the visualization previous to importing the JSON file will be lost, so please be careful. Remove everything (nodes, edges, colors, legends) from the visualization. This process is irreversible. PathwayFinder lets you select two (or more) nodes and retrieve all the possible paths of a given length between them in a particular interactome. Right now, due to performance issues on the client side, the user can only select up to 5 edges separating the given nodes. 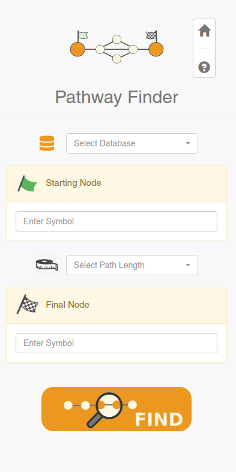 With this form you can select the StartingNode and the FinalNode. Human protein symbols (including * wildcards)-. Be aware that you can end up with several StartingNodes and FinalNodes. This will increase the potential number of results. Because each pathway will be a different visualization, be aware that the performance will depend on the computer power on the client side. For that reason, it is advisable to first select a small Path Length and try higher lengths depending on the results. Once everything is selected, press the button FIND. The results will appear on the left. On the top of the screen will appear a summary of the search and the number of results (in this case, 508 pathways). All the pathways will be sorted by the mean of the votes of all the interactions in it. That is, by the confidence. You can filter the pathways with specific contigs using the above search box and by clicking on Filter. You can use multiple contig identifiers by using commas ','. You can only use planarian contig identifiers here. Center the path on the visualization. 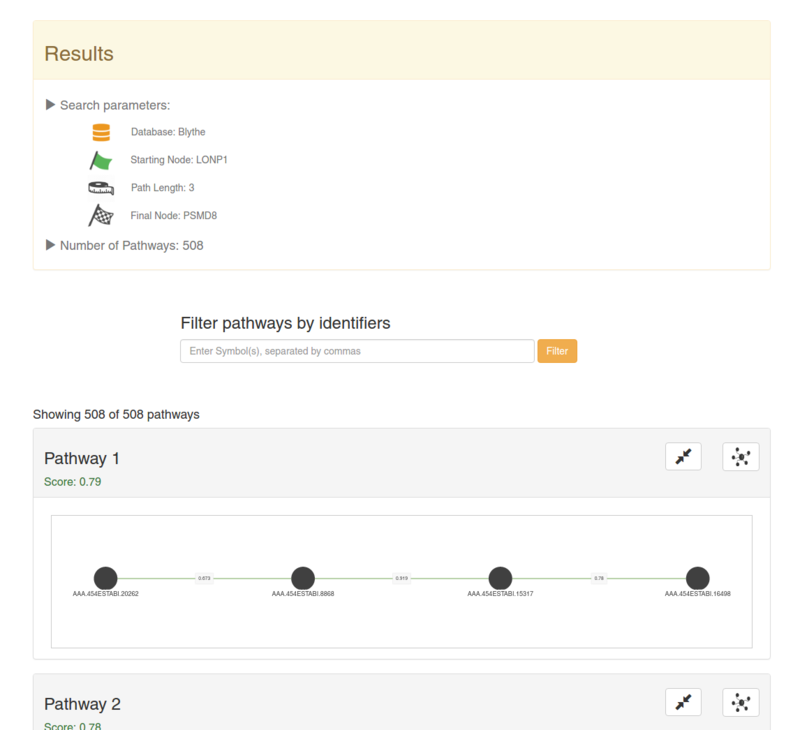 Open a new tab with the pathway on NetExplorer. You can click on the nodes to display an information card.